Having discovered where Bristol Parking Services park, the next issue becomes how. Diagonally across three of the bays and a "do not park here" bit of the Bristol Parking Services area was some kind of towing van. 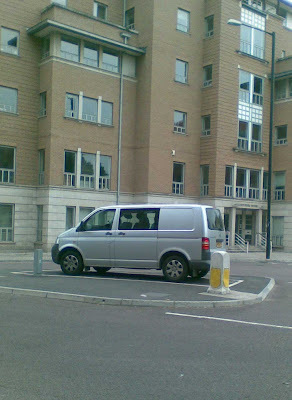 The kind of van you use to tow vehicles parked across three bays and a "do not park here" bit of a junction. 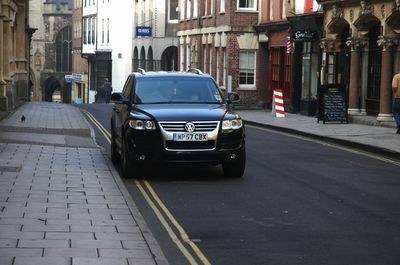 They are lucky there were no Bristol Parking Services staff around to enforce the regulations. There was, however, a BPS staff member to enquire about why someone was taking photographs -whoever they were they didn't try the "you can't take photos gambit". They did explain that there was actually a good reason for these vans to be here. And he was probably right: there are so many people parked illegally round the city there was nowhere else for Bristol Parking Services to park their towing van. The Bristol Blogger's story on Bristol Parking Services was a shock. There really was a Bristol Parking Services. Terry had sent a photo of a BPS van, but we suspected it was just something someone painted on a van so that that they could park wherever they wanted. Since everyone does park this way, one can infer that there is no BPS. But lo and behold, what should there be on Trenchard Street but a line of vehicles with Bristol Parking Services printed on them. So: Bristol Parking Service vans exist. What we don't have is any evidence that their staff exists or enforce parking. More on this topic later. as has recently been pointed out, replacing door mirrors on triumphs of Teutonic engineering like X86BLB pictured here is a challenge likely to require Central Bank intervention. 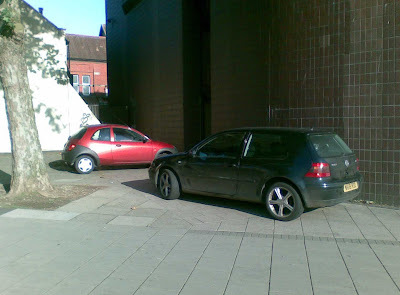 Best, then, to park well onto the pavement to minimise the danger of any passing vehicle (even on a quiet cul-de-sac behind the bus station) clipping your car. 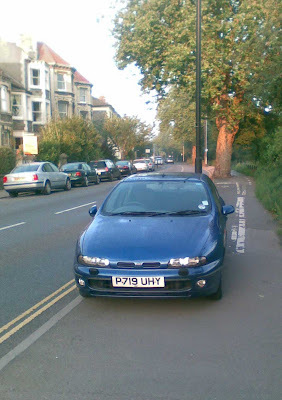 which leads me to wonder why this modest example of the People's Car that's close on half the width of the road isn't at least partially on the pavement. Still, it does prove that it's not just Range Rovers that are immune to any implicit dangers of parking on double yellow lines. You could argue I suppose, a driver being within the car, that WP57CBX is waiting. With the engine switched off no doubt to minimise its carbon footprint. In an attempt to provide motorists with extra parking spaces, traffic islands can now be used to park small or large vehicles. Because it has paid the "wingmirror tax". Fortunately, being a French car, loss-of-wingmirror is something they assume happens a lot, so it will clip back on easily, or be replaced at at a low price. It is German cars that tend to have a higher wingmirror tax. Their engineering team is given the goal of wingmirrors "fur autos ohnen geschwindigkeitgrenzen": for cars without speed limits. With a need to be stable at 220 km/h, they stay on when bolted on, and cost a lot when they come off. Take your merc or BWM round to the show room to get a new mirror and they will sit you down in a luxurious waiting room, serve you coffee, let you check your stock and bank balances with your macbook on their free WiFi, before breaking the news to you that the new wingmirror costs about the same as a new engine for a Fiesta, and that all your few remaining shares in non-nationalised banks will be required before you get your car keys back. This may explain why we had an interesting encounter with a blue Mercedes estate driver while cycling back from work with a friend this week, on this very street. There I was, cycling far enough out to not hit parked cars or get squeezed by oncoming cars, when the oncoming car decided to come through anyway. I tried the "Stop the bike but not move in gambit", which normally causes the car to a halt, then we can negotiate the problem safely. But no, this car speeded up, got through safely, and then came to a halt, jumped out and started screaming at me about not getting over enough. That's the kind of incident where you are glad you know the back streets and the bike-only bits better, as there are lots of escape routes. Some drivers out there have anger management issues. Remember, if you are trying to drive round the back streets of Montpelier at speed, do it in cars with affordable wing-mirrors. 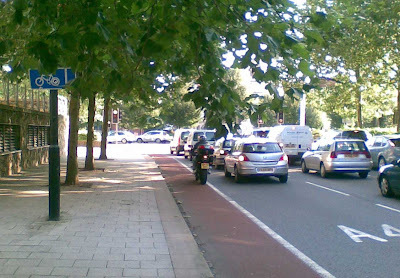 Joe Evans also sends in a photograph of the Coronation Road bike lane, though there is a car blocking the view. If you look past the car, you can see the path, which goes alongside the Avon new cut. This path is famous for its greenery. On the Bristol-Bath path you get greenery beside the path. Here you get mature trees in the middle of the path itself. This is why this bike lane is one of the most popular in the city, right up until it comes to a halt behind this car, P719UHY. Three submissions for our 'legally parked range-rover' competition, none of them winners. H5ERV or the two Picton-Street range rovers, that appear resident in Montpelier during daylight hours, probably as this stretch of open road is they only place they can park. These could be photoed every day, but that would make for a boring site. 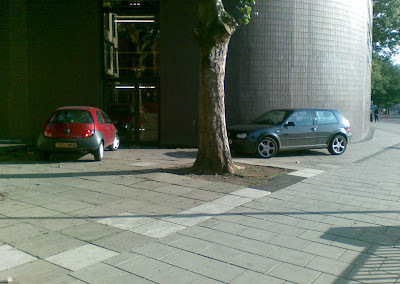 The only reason this photograph gets included as today one of the drivers is trying a smart-car style right-angles parking technique, which clearly lets a rangey fit into a parking gap only wide enough for an estate car. Yes, it does stick out slightly, but only cyclists suffer from that. If the bikes merge in with the main traffic flow, it won't be an issue. Clifton Bridge is closed to cars; open to pedestrians only. Which is important to do, as if you get on your bike at the end, even at 7pm when there are no pedestrians around, someone will come out of the gatehouse and harangue you "I could fine you 30 pounds". Best not to cause trouble. What you do get to see is the tarmac peeled back and the dark secret of the bridge, a secret that all the climbers on Suspension Bridge Buttress know and fear: the bridge is made out of wood. Old, 200 year old wood. Which, considering the life of oak beams is about 200 years, is kind of disconcerting. Here we have a bridge built at the dawn of industrial era civil engineering, when the best practises evolved by the Romans were discarded in favour of new techniques (suspension) and materials (iron bolts), and the early bridges were effectively wide-beta tests of the ideas. Wide beta tests built on the assumption that the primary traffic would be pedestrian and horse and cart, not a transit van full of alcohol bought on a trip to France. We are lucky that so far they have been shown to have designed well, and now the wood is being replaced in a timely manner. With the 2cm of tarmac pulled back, you can look through the gaps of the 10cm wood beams, to see the ground 70m below. Think about that the next time you go over it in a heavy car. 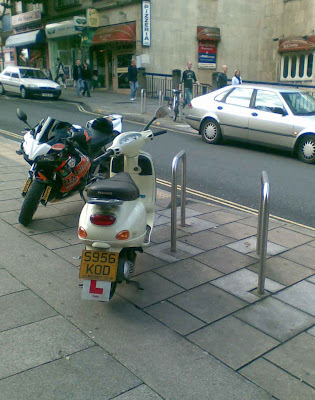 Joe Evans posts in a set of clips of motorbikes taking advantage of the facilities in Bristol, and says: Bristolian motorcyclists are a selfless bunch. 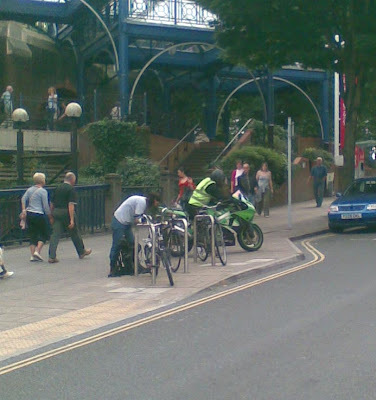 Here we can see them in action as this biker risks getting a fine for parking a motor vehicle on the pavement in order to show cyclists exactly where the stands are located by placing a bright green motorbike beside them. This new ‘Green Motorbike’ scheme is very useful of foggy days when vision is restricted. 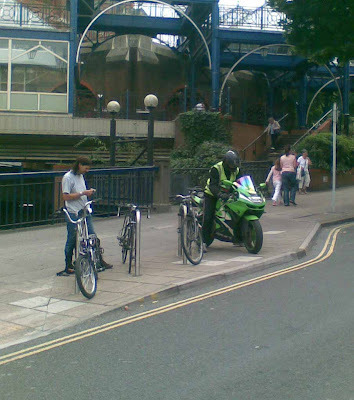 There is, however, one slight disadvantage to this means of alternative signage since the motorbike often needs to be parked as close to the stand as possible, but not exactly touching it (one nano-millimetre is preferred) and thus reducing the space available for cyclists. The Cabot Circus marketing organisation has spent lots of money entertaining the local printed and TV media. However, despite PR Bristol listing Bristol Traffic as part of the city's new media, no invitations. Which is a shame, as all forms of bribery will be accepted, though the sponsor will be listed. This posting is sponsored by the Bristol Trails Group, who, in combination with the weather, have bribed us with the best mountain biking conditions since February, only now its warmer and stays light later. The trails group are looking for funding for the Leigh Woods trail improvements, so perhaps the Cabot Circus marketing team could consider having a nationally renowned trail named after their project. Here is a biker called Liam on his way home. I'd hoped the flash would have gone off, but no, we get a silhouette of him on a trials bike. The golf course was just picking up a layer of fresh mist for the evening. You probably have to get on the pavement at this pedestrian crossing, and then drive along behind the barrier. Parking here has two advantages, alongside being free. 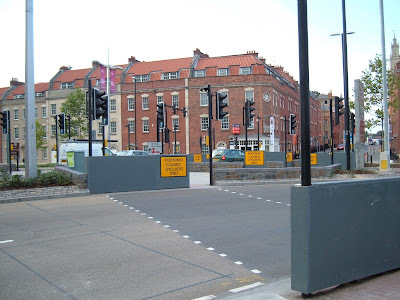 You can use the pelican crossing lights to stop the cars when you pull out (just drive up the crossing and press the button), and because of the crash barrier, you can be sure no passing vehicles will clip your wing mirror. Terry Miller sends in this photo of some of the "improvements" near Cabot Circus, on the junction of Bond Street South and St Pauls Street. signage is needed to divert westbound pedestrians BEFORE they reach this BLIND CORNER crossing. We look forward to the opportunity to write letters to the Evening Post complaining about pedestrians getting in our way, as having someone using a cyclists only facility in the city is as as wrong as those fell runners who go round the Ashton Court MTB trail because they like the mud. Cycle facilities are for cyclists! There is, however, one little question. Why do this? The purpose of road crossings is to provide a safe way to cross roads. If the crossing gets taken away, will the people suddenly not cross the road? Or will they just run out anyway? It would be interesting to have a discussion with whoever designed this junction to discover what assumptions about pedestrian (especially child) behaviour they had made, what experiments they had perform to test the validity of the aforesaid assumptions, and whether they were to engage in long-term monitoring of the facility to see if the assumptions held up in the field. Civil Engineering may not be a science, but there is no reason why it should not be scientific in its approach. Now seeking: photographs of pedestrians ignoring these signs and inconsiderately inconveniencing cyclists. There's a police car (WX07VDG) outside Bike Bristol, helping to make sure nobody nicks a bike from inside -that being why all the bikes on the floor near the front of the shop have their stem loosened; to make them unrideable. With two police in the shop that won't happen. Parking on the double yellow lines here is justifiable for two reasons. One, they were in looking at bike parts. Two, this is reserved for taxis, and as far as cyclists are concerned, Taxis are the enemy. And so get into the queue leading up to the M32 that much faster. It's a tough road to walk or cycle across; you need to wait at the lights and factor in to the light schedule the fact that cars coming off the m-way are slow to react to red lights. In the Bristol Cycling Campaign, the Muller Road/Shaldon Road junction is viewed as positively lethal, the fact that 'safe route to school' improvements made it even more dangerous should have been a warning sign about threat that a "cycle city" bid could present. One thing that Josh's study didn't do is ask where do these cars go to? Where are they coming from? Assuming they are coming into the city on the M32, not using the ring road exit but pulling off before getting stuck in the traffic jams by the M32 junctions further into town, these cars are heading to North West bristol, but not the North Fringe. So where do they go? So, WV57EUU goes in the database. Incidentally, one stevel is now the Bristol Cycling Campaign's School officer (self-appointed). Building up a set of pics of how every school in Bristol deals with their transport issues -and what their safe route to school plan is- is something that would be useful. So when a visit is paid to the school, we can bring up the powerpoint slideware of what they've been up to, along with a spreadsheet print of which cars appear to be particularly dangerous towards pedestrians. These are going to be some fun discussions. Here is something not yet seen since the data collection/mining experiment began: a car ticketed for parking in Kingsdown, here on Nugent Hill. I suppose it would be time to be smug about a vehicle getting ticketed for corner parking. But no. Because it isn't doing anything wrong. The Nugent Hill/Sydenham Road junction is such a gentle angle that it barely constitutes a corner; there are no dropped kerbs and it isn't inconveniencing cars. If the police were going to go round Kingsdown to ticket a few cars, there are other places where the way the cars are parked either is inconveniencing other road users and pedestrians, or is a sign of dangerous driving. Here in Fremantle Square, there are four cars facing the wrong way down the one-way stretch. Number of tickets: zero. 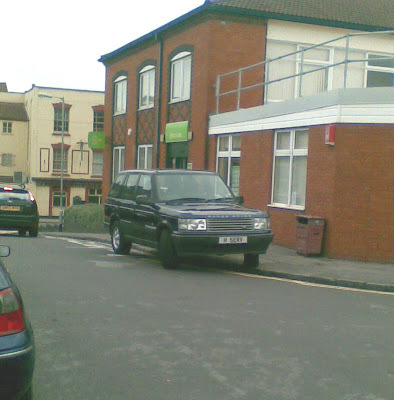 And here in Somerset Street, there is car parked up on the pavement, despite the fact that there is a space opposite. No sign of police ticketing the car WX04NFW. There are some people -Chris Hutt among them- who believe that the fact that the Squarepeg "cycle houses" will have steps up or down to 16 of the 20 houses they will build 3 m from the railway path means that they aren't cycle houses at all. That in fact anyone trying to get a bike in or out will ignore the steps and their wheel groove, and instead loop round to the garage. And that they are pretending to be cycle houses to justify their acquisition of a bit of parkland and the defacto enclosure of some more. 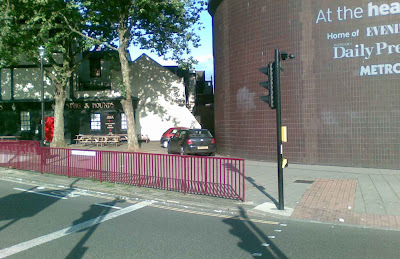 But like Rowland Dye, here showing the distance between the path and embankment is just over a bike length, that belief that stairs have no role to play in urban cycling is either one of ignorance or a consequence of using drop bar bikes, bikes whose Centre of Gravity on a flight of steps is pretty hairy. Runout: check there is a clear, flat stretch with no approaching cars or other traffic. 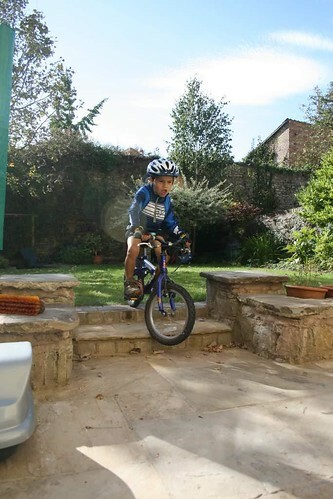 Align: get on the bike, get it stable and don't be mid-turn when you hit the steps. Commit. Go for it. Don't touch the brakes, keep your weight back. Only slow down on the runout. That's all it takes. So cycle houses with steps on them could work. The key is getting the design right. Firstly, you need to be aligned and stable before the steps. The houses will need a little porch, and a front door that automatically closes and locks as you ride straight out. Secondly, you need a clear bit of path to come out on. And that worries me: the path is busy, busy, busy in the morning, and having steps that runout at right angles to the main traffic flow is suicidal. The steps need to be angled so that they feed into the bike lane gently, giving you a clear runout that won't create a collision with someone doing race training from Bath or a group of trials bike riders heading to Castle Park. If they don't do that, if they don't make the steps fun and safe for even a four year old to ride out on, well, then it wouldn't really be a cycle house and giving up some of the parkland to build them would make no sense whatsoever. Jah P has sent in a link to one of his photos: the school run outside Sefton Park School. 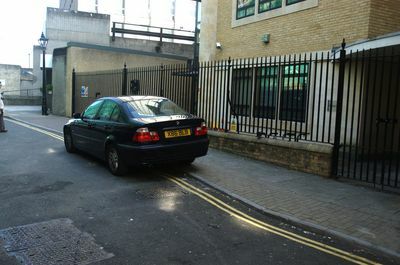 The sign says that "Parking near the school entrance is dangerous and selfish". This is why one of the parents is clearly unloading in the middle of the road. It leaves the pavements clear, stops cars speeding past the school and acts as a form of traffic calming that encourages cycle dropoffs. It may not have hit the Evening Post yet, but the civil engineering press knows: Bristol is bidding for congestion charging. Which, given that it has serious congestion problems, makes sense. Not only does it make walking and cycling more cost effective, it lowers the cost advantage that driving has over FirstBus (of course, value fares and an effective public transport system could also do this) and makes the cost of driving into town more tangible than a weekly fill-up or yearly service+MOT+insurance. It also penalises people who use the car, rather than just own one but leave it outside their house on weekdays. And, if we follow London's lead, the charge can be made worse for group G cars and less for hybrid/zero pollution cars. More subtly, London doesn't (currently) offer a resident's discount on a Group G car, so if you live in the C-zone, you get to pay 25 quid a day for driving your Porsche in to the city where you get to unwind your hedge-fund's exposure to the US. It is this daily fee that has really killed the group-G resale value in the south east, and so deflate demand across the whole country. It requires the city to roll-out a ring of ANPR number-plate monitoring cameras and record every journey into and out of the city; data they will retain for up to five years. There's a fairly complex billing system that needs to be run, one that takes up a lot of the fees. Where will the rest of the money go? To FirstBus, probably. Which is so very, very wrong. At least in London, you know that Transport for London is trying to help you. Hybrid cars still take up space and cause congestion. So why should they get a free ride? Surely they should still be charged something? So: a fee that is focused on those people who drive round the city. with a fairly complex billing scheme to make it all work. we shall see. An alternative option would be to enforce parking rules in the city as it stands, so reducing the parking spaces by 50%, and therefore discouraging vehicle use without so much of an infrastructure behind it. (photo: van trying to get round lorry blocking picton street unloading and various cars parked on yellow lines). Robby Golbin, of Psyclewerx - best high-end MTB shop in the city- won't be doing much technical off-road for a while. Because on a recent trip over to one of the welsh "resorts" he managed to come off, dislocate a shoulder, tear lots of ligaments and three muscles. He's got a rather large set of stiches on his shoulder slowly healing, his arm in a sling and a wrist bound up to stop nerve damage. Which shows why its dangerous to go off-road on your own, even if it is normally pretty safe. What is impressive -and is very impressive- is that he is still cycling to work. One handed. Getting off the bike and walking across junctions. That is dedication. Joshua Hart's study implied that busy roads had less of a community. But what if it goes the other way? A strong community spirit reduces through traffic? Here we have some photographs of Portadown, County Armagh in Northern Ireland. Birth place of the Orange Order, with Drumcree Church to the North of the town, it is a flashpoint even today. But what are the positive aspects of the town? A key one is the strong community spirit. Look, the walls are painted in bright red-white-blue or orange-white-green colours to indicate which part of the town you are in. And in the unionist quarter, the entrance to a wide street is marked with a big banner saying "No Surrender", "Honour the King" and "Fear God"; strong community statements one does not normally encounter in the mainland.. The whole length of the street is decorated in flags and banners, and even though it is quite a wide road, it has surprisingly little traffic. Even a stranger walking down the road taking photographs is enough to encourage curiosity. As a result, this area has both low traffic and, low crime, although apparently the disarmament of the paramilitaries has increased the amount of local crime, as burglary and car theft is no longer punished by kneecapping. Looking at the celebratory nature of the streets, and the benefits for community spirit, one must wonder if Bristol could adopt such practises. Obviously religion would not be a viable theme, but there is always sport. However, few streets have such uniform support for either of the city's football teams that one could have Bristol City or Bristol Rovers areas, and those same supporters would probably view pro-Bristol Rugby decor as being anti-football. So what does that leave as a sporting theme for Bristol residents to get behind and build street communities from? Gloucester County Cricket team! Joshua Hart has done an interesting study in Bristol, which shows that people who live in streets with more traffic visit their neighbours less. This is interesting, but what cannot directly say is "living on a busy street makes you friendless". Why? Because one possible hypothesis is that friendless people choose to live on busy roads. Houses on/by busy roads cost less, they are often divided into flats and may have higher turnover. And it is that turnover that may effect things. What would be interesting would be take one of the roads in the study -such as Muller Road- block it off to car traffic for a month, and see if that leads to increased neighbourliness. Having seen the consequences of Cotham Brow being closed to traffic, and how much quieter the whole area became, the results may be surprising. They make kids walk to school before 8 am in France. Walk. Even though they get little wheelie bags to make it easier. And all the parents seem to go along with this, as there is no sign of any cars. How was such a miracle pulled off? Ah. Fencing off the road. That would probably work in Bristol too, though it would create an extended dropoff-zone further away from the school where all the danger would lie.